Nestled in tropical gardens, your stay at a Brigadier King Studio will make you feel like one with your beautiful surroundings! With all the amenities that will bring you comfort during your stay, this accommodation is the perfect haven for when you want to have a relaxing holiday! Don’t stress about how you’ll get there! We include all the essentials, so your return airfare and luggage are sorted — just pack that 7kg bag and head to the airport! To upgrade your luggage allowance just ask our Holiday Experts. Enjoy continental breakfast each morning for two at Reef House Restaurant! Start your day with a delicious meal consisting of locally sourced foods that will provide you with the fuel you need for a day full of activities and relaxing! Feast on this! During your stay, enjoy a mouthwatering 2-course dinner for two at Reef House Restaurant! 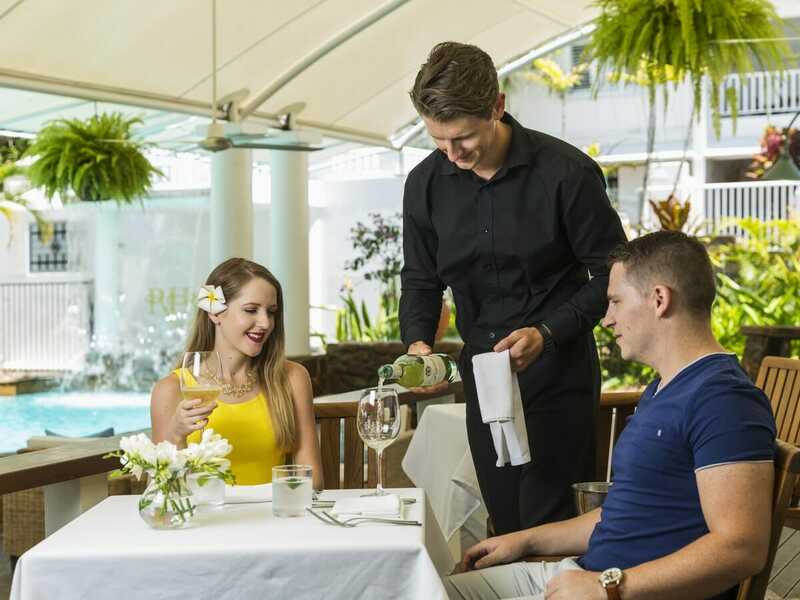 So take a seat, relax and let the talented chefs at Reef House Palm Cove spoil you! Get into the holiday spirit immediately! Starting your tropical holiday on the right foot is easy with a drink in hand and a cold towel. Lie down, relax and completely unwind! Treat yourself to some well-earned pampering at Reef House Day Spa with this 2 x $25 spa vouchers on us. Your stress will melt under the staff’s expert touch! Spend and save when you visit the Reef House Day Spa. With 15% off retail products, you can spoil yourself without any of the guilt this holiday! Every night, enjoy the resorts nightly Brigadiers Punch & Canapes and sip on the resorts signature punch while enjoying delicious canapes as the sun sets. Escape the Queensland sun and satisfy your sweet tooth by the pool. Kick back and relax on one of the lounges around the pool and sink your teeth into the delicious sorbets served daily. Rest assured that there will always be a place for your car this holiday. Gain parking and peace of mind when you stay at The Reef House Palm Cove! Take home something to remember your holiday by. Receive two Reef House caps when you visit Palm Cove this holiday. Get active and discover Palm Cove in a unique way! 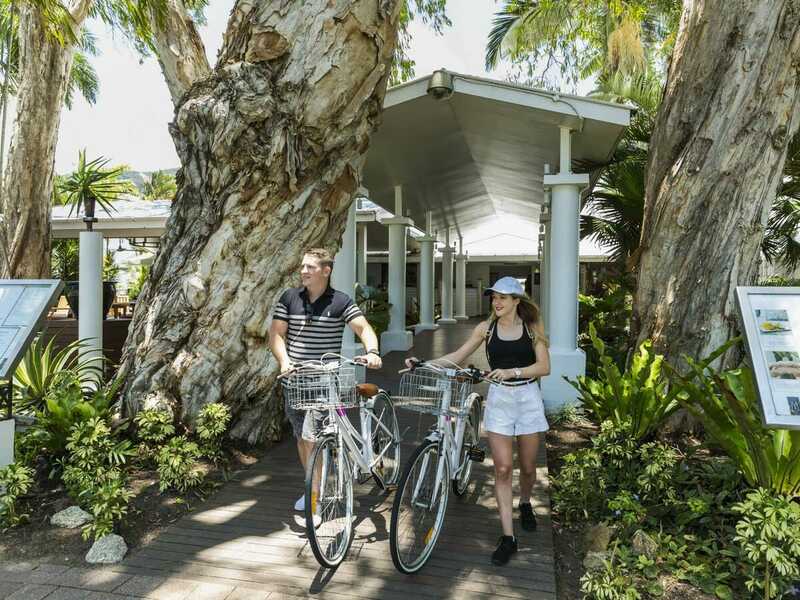 A resort bicycle is all yours for you to leisurely explore plus you can use the resorts fishing rods to cast a line and test your luck in the waters surrounding Palm Cove! Perfect for a night in or a rainy day, surf the net, watch a movie or even just relax with a good book! Retreat to the cosmopolitan beachside hub that is Palm Cove and enjoy a relaxing, boutique stay at The Reef House Palm Cove. 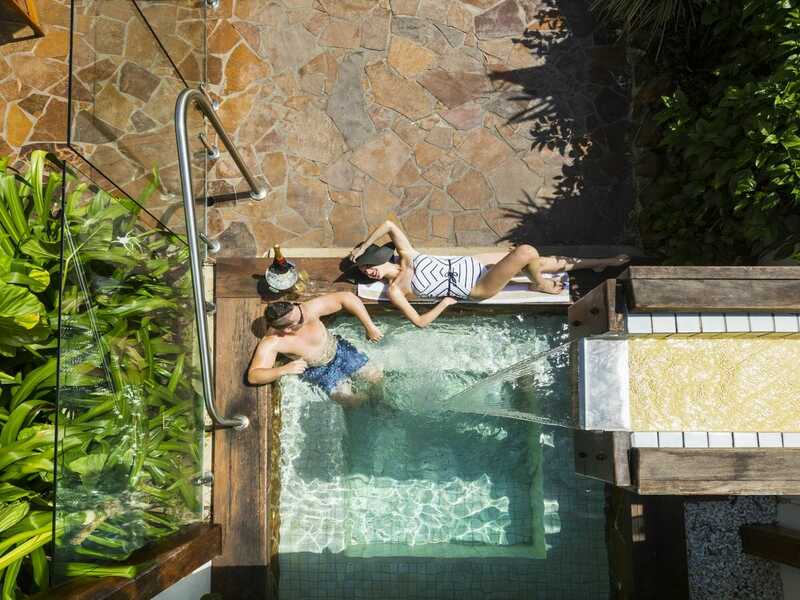 Set just 25-minutes north of Cairns, this resort is small but luxurious. Centuries-old melaleucas and tropical gardens surround it, the beach is just steps away and the facilities are absolutely magnificent! 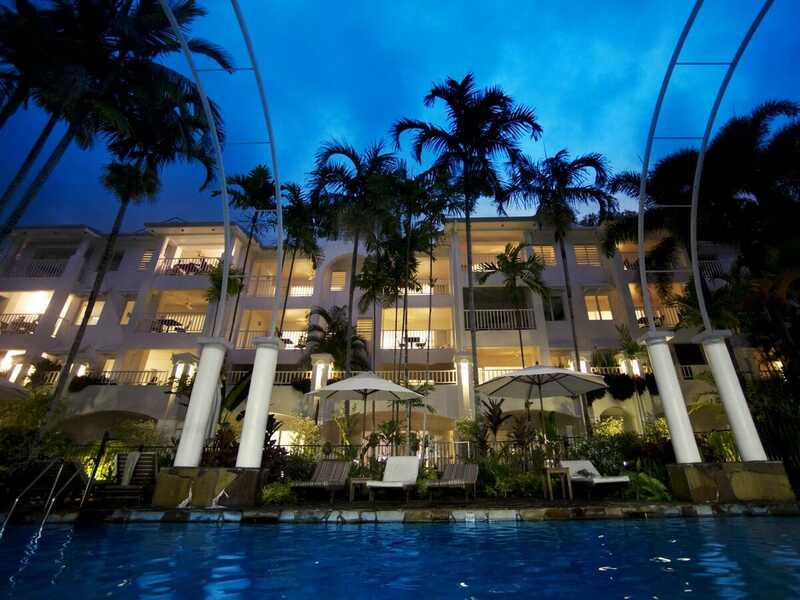 The Reef House Palm Cove is part of the M Gallery by Sofitel collection. 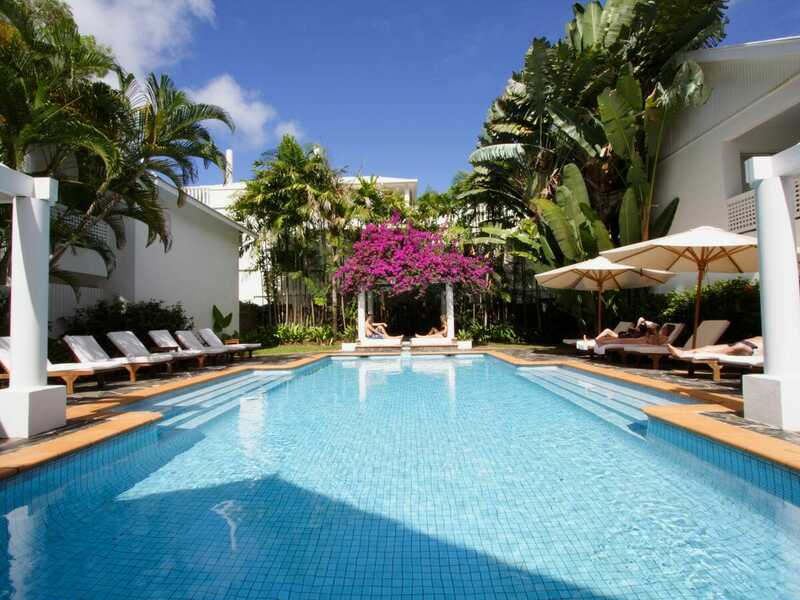 It boasts grand colonial architecture, 2 outdoor pools, a full-service day spa, hair salon and more. 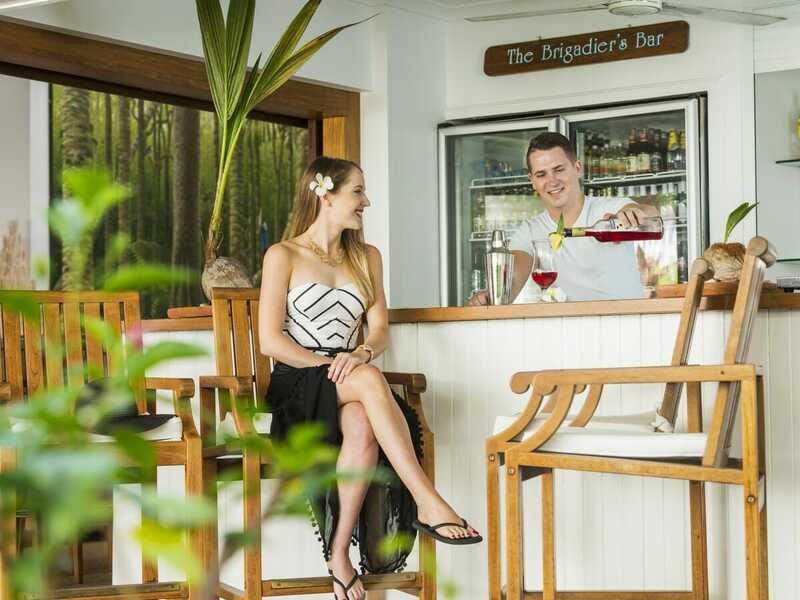 Dine at the multi-award winning, signature Ocean View Restaurant and Bar, enjoy exclusive access to the Brigadier Lounge and Honesty Bar and completely unwind during your stay! The Reef House Palm Cove has 67 rooms and suites. The level of personalised service there is truly exceptional and guests are made to feel completely at home. The rooms are spacious and comfortable. 4 poster King beds will make you feel like royalty and tasteful artwork, linen furnishings and natural finishes enhance the tropical surroundings. Enjoy tropical breezes out on the balcony, separate luggage, vanity and bathrooms, white plantation shutters and a mini kitchenette. Every design element within the rooms has been carefully chosen to add another level of luxury and all work well together to enhance your already exotic beachside retreat! Guests at The Reef House Palm Cove are invited to enjoy daily complimentary canapes with the General Manager at twilight plus there are a range of personalised services on offer from the concierge. Wi-Fi is free throughout the resort, there are bikes available to explore the surrounding village and 24-hour airport shuttles are available on request*. 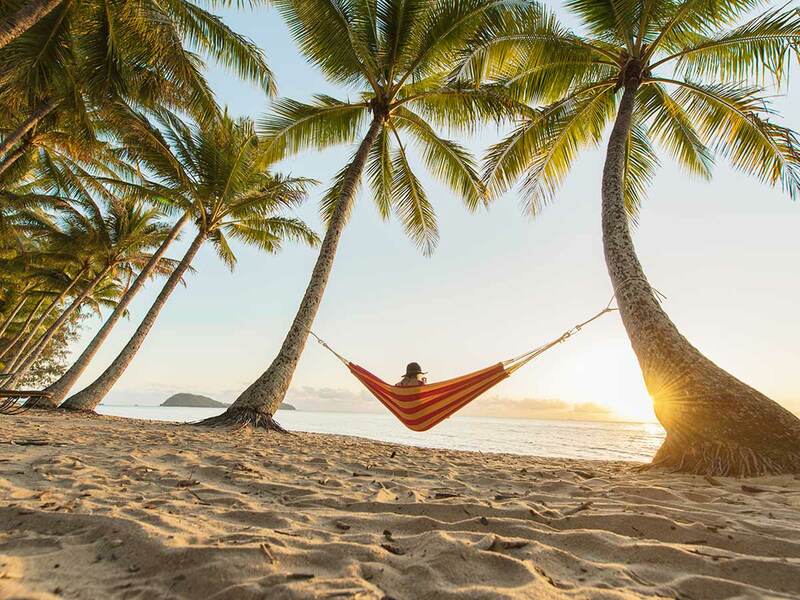 Palm Cove Beach, Clifton Beach and Clifton Village Shopping Centre are all within 5-kilometres of the resort and the Great Barrier Reef and the Cattana Wetlands are within 15-kilometres (there’s a tour desk on site to arrange getting to these). A stay at the Reef House Palm Cove with leave you feeling completely rejuvenated—it is so good that guests are known to return again and again! #1 x 2-course dinner for two – food only. ^2 x $25 spa vouchers – minimum spend of $100 per voucher. **Flights are based on promotional economy class fares. Flights may not be direct or operate daily. Cannot stay longer than 1 month after departure from point of origin. Prices are subject to promotional fare availability. Air surcharges apply during Australian school holidays and Peak periods. 1 x Carry-On bag only max 7kg. Prices are correct at the time of publication, are twin share per person, may change without notice & subject to availability. Restrictions & conditions apply. See website for full terms, conditions & travel dates. Prices quoted are on sale until 30 APRIL 2019 unless otherwise stated or sold out prior. Seasonal surcharges & blackout dates may apply depending on date of travel. Additional fees, including surcharges and visa fees specific to your departure date may apply. Payments made by credit card will incur a surcharge. Advertised price includes any bonus nights. Please ask us for further details or visit our website at www.flightcentreexclusives.com.au. Flight Centre Exclusives provides holiday packages offered by Ignite Holidays Pty Ltd & is a subsidiary of Ignite Travel Group. ATAS Accreditation No. A10345. ~Approved applicants only. Fees, terms, conditions & minimum finance amounts apply, incl $99 Annual Fee charged on the account open date and annually on the anniversary of that date. Annual Fee must be paid in full within 90 days or it will attract interest. Minimum monthly repayment required. Interest, (charged at the Expired Promotional Rate) payable on outstanding balances after any Interest Free Period. See skyecard.com.au for current interest rates. Only available at Skye retail partners.  Credit provided by FlexiCards Australia Pty Ltd ABN 31 099 651 877 Australian Credit Licence number 247415. FlexiCards Australia is a subsidiary of FlexiGroup Limited. Mastercard is a registered trademark, and the circles design is a trademark of Mastercard International Incorporated. Don’t know your travel dates? With BUY NOW, BOOK LATER you can guarantee you don’t miss out on a deal before it sells out. Simply buy a voucher for the package you want and book it all in later . ^ Please note payments made by credit card will incur a surcharge. ^^ Single supplement charges may apply. Call Flight Centre Exclusives on 1300 222 900 for more information. Be the first to know about our newest hand-picked holiday packages at unbeatable prices. © Copyright Ignite Travel Group - All rights reserved.